It is obvious that the current articles are touching a few raw nerves and events are starting to unfold. This is a repeat of one particle article that I did some time ago that has resulted in Tara Andrea Davison taking out deformation against all those concerned with its publication. Many times this article has been taken down but then re instated as it was proven that all the contents were taken from the public domain and did not breach journalistic protocol or reveal private details about Ms Tara Andrea Davison. All the information is as recorded from many locations that give details of registered and de registered companies and their addresses and does not therefore infer any aspect of deformation. Gordon Bowden, who has investigated many types of fraud, stands firm in is accusations against all the people and companies that he names in my articles. Today he pointed out to me that he would encourage any of those named in my articles to come forward and take whatever action they wish. Gordon has always wanted this to come before the courts so that at long last he will have a legal platform to open up a can of worm and show the forensic evidence he has against all those named. I received today 17/ 9/ 2010 a recorded letter from Ms Tara Andrea Davison. The 4 page content of the letter is to make record of intention to lay charges of Libel and defamation. Please note I have included Ms Tara Davison as a cc recipient. (name concealed), should you contact Tara by phone, could you please mention verbally, she must immediately commence legal action against me (Gordon Bowden) for using recovered material, affidavit statements, Court Document Files, Letters, Dossiers, freely with no written restrictions of copyright published by herself, (Tara Andrea Davison) of Derby Police action in January 2010 against her, into the Public domain and Internet sites including that of now removed. 20 PAVIUO. RHODES. 85100. GREEK ISLANDS. Should Ms Tara Andrea Davison wish to proceed. I look forward with great enthusiasm to any Court, public, press accessible hearing. 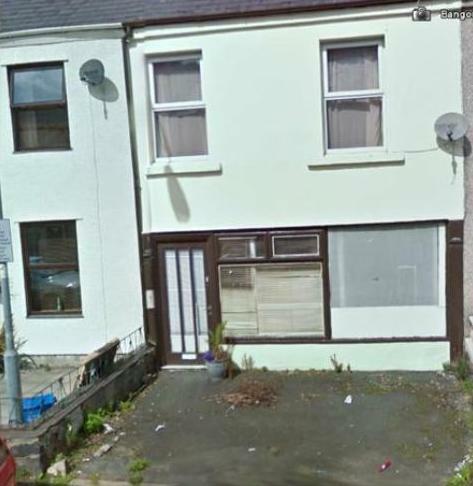 Manchester House (The Corporate Boiler Room) – 32 Bangor Street, Port Dinorwic, Gwynedd, LL564JD. Wales United Kingdom – The past registered corporate headquarters of many many businesses that have come and gone – A nest of virtual or shell companies. The common corporate secretary/receptionist will ask you to wait in the VIP/Investors lounge whilst she tries to find one of the many directors that have their offices within……..one word of caustion……….mind the trash in the courtyard as you go in and the eloborate tropical plant by the front door………the spikes can inflict a deep wound!! I would assume that parking could also be a major problem for all the staff working at Manchester House! As I have preveiously pointed out this is an old article we did together in September 2010 which caused many problems for those that published it as well as Gordon and I. There is currently a case against us made by Ms Tara Andrea Davison on the grounds of deformation which we all will defend. 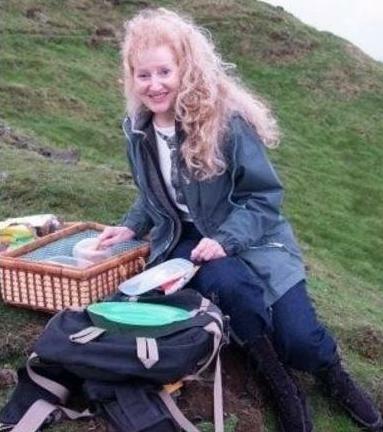 A Case Management Conference was held on the 9th of May 2011 at 12pm in Room E117 at the High Court of Justice – Queens Bench Division – The Strand – London for a duration of 30 mins where the claimant – Ms Andrea Davison and all the Defendants were briefed. Ms Davison decided she wanted to expand on the deformation and also file an injunction on us to stop these articles. She was advised to re file the defamation all over again and the injunction will also have to be filed elsewhere so basically everything is now void pending her further actions….no date has been fixed yet until after her action and certainly not before early July. 32 BANGOR Street. Port Dinorwic. Gwynedd. LL56 4JD????.Gordon. I made $225000 in two months. Gordon has always wanted a media platform to raise awareness to the general public and also to draw attention to all those that have or intend to invest and warns them to be over cautious in any future dealings. 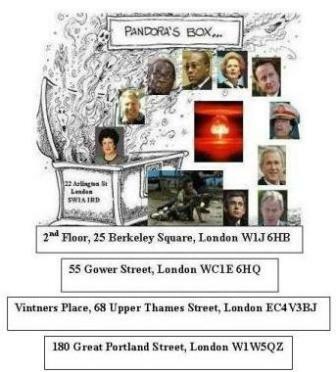 Pandora?s Box is that outlet and so now it is time to step it up a notch and start naming more people, companies and some very high profile people behind many of these scams. You will see some other names come up that may ring a bell with some people……anyway as they say crime pays and so Arlington Associates and Lonrho continue in their Asset-Stripping Empires and the Serious Fraud Office do nothing……oh and if you see someone wearing a trilby, trench coat and very dark sunglasses do not be too alarmed it only Tony Blair on his way to 22 Arlington Street and then off to the attached Ritz for a well earned tea and biscuits!! The registered office of the Company has changed from Level 4, 22 Arlington Street, London SW1A 1RD to 2nd Floor, 25 Berkeley Square, London W1J 6HB with immediate effect. Peter Slot this RNS into our next article. Zest is pleased to announce the appointment of David Anthony Lenigas to the Board as a Non-Executive Director with immediate effect. David Lenigas holds a Bachelor of Applied Science in Mining Engineering. He has extensive experience operating in the public company environment and is currently Executive Chairman of Lonrho Plc, LonZim Plc, Leni Gas & Oil Plc, Solo Oil Plc and Templar Minerals Limited, Chairman of Lonrho Mining Limited and an Executive Director of Vatukoula Gold Mines Plc. 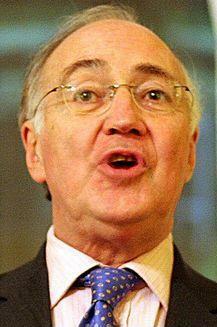 in South Africa and of which David Lenigas was a director, was placed into liquidation on 16 October 2008. The liquidator has prepared the first liquidation and distribution account and this was published on 15 January 2010. 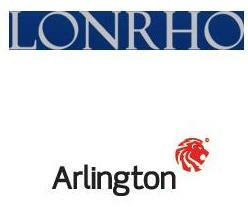 Lonrho plc is the largest creditor. The secured creditors and ex employees are currently expected to receive payment of their preferent portion of their claims in full. Lonrho Mining (SA) Limited , a company that David Lenigas is a director of and a wholly owned subsidiary of Lonrho Mining Limited is currently in provisional liquidation. 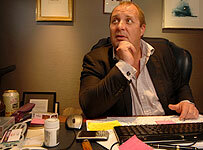 David Lenigas has an interest over 40,000,000 in the Company equating to 8.4% of the issued share capital. No further information is required to be disclosed in accordance with Schedule 2(g) of the AIM Rules for Companies. What I would like to point out is the fact that what Gordon has uncovered so far only covers one small area of fraud/corrupt activities. Based on this one could imagine that if this is multiplied time and time again we can maybe see why we had a financial meltdown? ?..these people never suffer during any economic downturn, they continuously provide false data to inflate the share price and at a given time advice their shareholders that after a series of exploration drilling programmes the actual drill data has not revealed the expected yields as first expected etc ?.they then close it down and move on to do the same elsewhere (and frequently change addresses). What the investors do not realise is that in most cases no drilling has ever taken place and no mines actually exists. CAMEC and it?s group interlinking subsidiaries. Think now, how did Bredenkamp launder his “Spoils” for 3 NUKES. “HOW WOULD HE LAUNDER IT” get it into the SYSTEM. GOLD MINES: “VIRTUAL” or Abandoned, Flooded, Care and Maintenance, mineral gutted piles of JUNK , spade holes in the ground. a reply from me, to give a CLEAR picture on the “Smoke & Mirrors” structuring of interlinking “Virtual” Companies. “Where the Directors conspire to steal the ASSETS of the Company by purchasing Acquisitions that are WORTHLESS PILES OF JUNK. Sir Bill Gammell attended FETTES College Public School, where he became a very close friend of TONY BLAIR. CAIRN ENERGY agreed to sell 63% of the SAME LICENCES that now comprise CAIRN INDIA to VENDANTA RESOURCES.. So, here’s what SIR BILL GAMMELL and his close VIP friends won’t want you to know. Is actually a GROUP entity. Underwrote $ 100 MILLION ,an unsecured “LOAN” One month BEFORE it acquired a rig for “DRILLING” ?????? MEDOIL Ltd is actually a subsidiary of. Aaaaaah, but look, not long resigned from the Board after I wrote them a few (RECORDED) e-mails. You might have picked up that name “TREVISAN” mentioned before. Yes,you did, in the VIDEO. ABC 4 CORNERS “BAD COMPANY” The Brett Kebble assassination. Yes, SIR BILL GAMMELL, TONY BLAIR, GEORGE BUSH. Well, Nigel John and your Expert Superiors. to conduct. Systematic interconnected corporate Asset Stripping, Money Laundering, Bank Theft, False Accounting, Director Insider Trading. Let me ensure these records of communications are preserved for accountability. Unlike the “vanishing” forensic records of Dr David Kelly, that distinguished MP’s and VIP’s continue to cover-up their criminal common theft and “FAKE” “VIRTUAL” Company FRAUD participation in support off the same network in the COVERT illegal profitable Arms trade, and the NUCLEAR Scandal of the 1991, 3 “CYLINDERS” Pelindaba, Pretoria Battlefield Nuclear Bombs. Let me AGAIN remind you, YOUR CRIMINAL NEGLIGENCE has resulted in the loss of £Billions to our Financial Banking Institutions and L.S.E. AIM Private Investors. Had you acted on my Legal forensic documentation information since September 2005 to HALT the criminal operations of the COMMON “Musical Chairs” group of directors. Organised Crime Experts, Please, don’t make me laugh. Mr Gordon Bowden – End of email. (Formerly EAST COAST ENERGY CORP) Having slaughtered a massive CASH BURN) Costing the BANKS and Private Investors MILLIONS. It would seem, crying “WOLF” to gain Prosecution protection for TARA from her business partners and “SENIORS” has maybe backfired. Her Postings on various Lib Dem sites has subsided, to a dribble. More important and of note. Her site : www.afbio.co.uk has been pulled. In anticipation of this, 3 Months ago. I recovered and duplicate copied all site files, letters, and statements and passed to a 3rd person, just in case. The Police are staying VERY silent and even under the Freedom of Information Act, they won’t say anything about TARA’S arrest or future prosecution charges. As I suspected, their IT Experts are trawling the information from her Passport entry and visa usage locations, Lap Top Computers IP Addresses, Hard Drives, 6 Mobile phones to recover forensic evidence on the Larger network she works with. You might note: a few web sites running the PANDORA’S BOX, Ambassador Frances D Cook Palestine Telegraph Articles have been “Blocked” and Removed. who coordinated company interlinks at. The SERIOUS FRAUD OFFICE EXPERTS. To ensure Forensic recording of communication. protecting the United Kingdom against Organised Crime. Aiding, assisting and protecting Government Members of Parliament, and senior members of the House of Lords, all identified. Here are a few more, (FOR THE RECORD) that will all follow the SAME Orchestrated historical path to financial collapse. WHY. They are ALL organised Fraud fronts operated by the same group. ALL interlinked, COMMON Director, interlinked Corporate Fraud Asset Stripping Companies, stealing £Billions from our Banks and Private Investors on the Unregulated AIM. L.S.E. 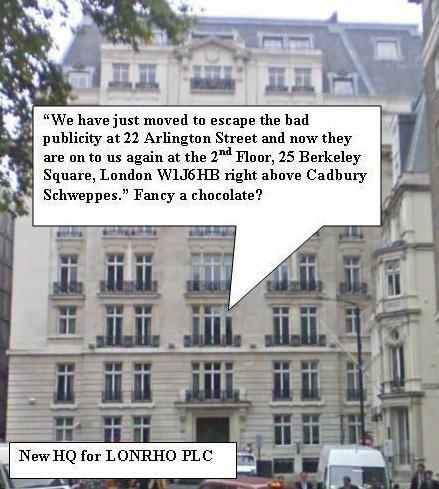 Now, if you add their Subsidiaries, group structures and Joint Venture Partners theres a substantial bundle of WONGA being stripped from our Banks and private investors, by a large bunch of slick, suited, smart Ars- thieves, for nothing more than. And you hunted Ronnie Biggs for 25 Years for stealing a couple of Million. What a bunch of Numpties or could that be your. 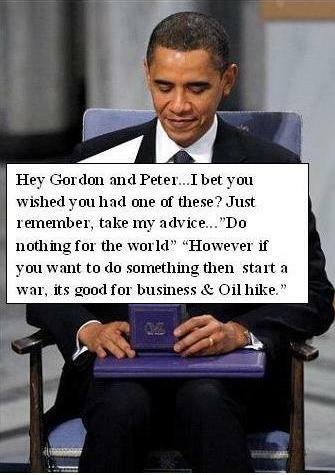 Obama receives his Nobel War ……sorry I meant Peace Prize!!! Now maybe you are starting to see the big picture and understand why Gordon Bowden is infuriated with the Serious Fraud Squad. In his own words he told me he’s extremely proud of his country and that he served in the armed forces defending it and yet no one is prepared to save our country from the fraud and corruption that continues to take place. Don’t you ever ask yourself why such people as Obama received the Nobel Peace Prize or Blair who received two awards from Bush and Clinton and yet unsung hero’s such as Gordon Bowden and many others on this planet, who bring you the truth never get a mention? The world is truly screwed up in my opinion and it is obvious that all this rot goes right to the top of the “New World Order” who obviously get their money in the same way. Keep watching this space……it really does get much hotter!! of this weblog; this blog includes awesome and actually excellent stuff designed for visitors.